Whistler Mountain Star: 2 - 3 Bedroom Townhome Listings: Haven't heard enough raves about Mountain Star accommodation in Whistler? Take a look and see for yourself just how spacious, amenity-rich and affordable a rental at Mountain Star can be. Pay less for your Mountain Star rental by booking one of the units below direct from the owner to cut out middle agent fees. Want to learn more about this development? Check out our in-depth Whistler Mountain Star analysis including pros and cons, suitability and more or view a Whistler Mountain Star map. Accommodation in Whistler by Development - see all Whistler rental developments. 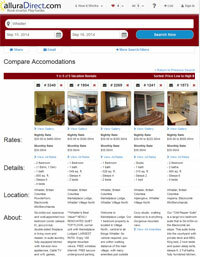 Whistler Accommodation Resources - Get booking tips and read about vacation rental standards & guarantees. Search all Whistler Accommodations - With 550+ top-located Whistler vacation rentals, you'll find what you want in less than two minutes. Whistler BC Trip Planning & Deals -Visit our Whistler homepage for trip planning information, weather forecasts & huge direct booking deals on lift tickets, gear rentals, activities and more. Whistler Mountain Star Homeowners - List Your Vacation Rental! Self-manage your Whistler Mountain Star vacation rental, wherever you live in the world! Dump expensive commissions and take control of your Whistler property with less than 5 minutes effort per day. Learn more about how to take control of your Whistler Mountain Star vacation home or contact us to learn more.